Ivanka Trump's role has already come under scrutiny because there is little precedent for a member of the first family with this kind of influence. WASHINGTON: Cementing her role as a powerful White House influence, Ivanka Trump is working out of a West Wing office and will get access to classified information, though she is not technically serving as a government employee, according to an attorney for the first daughter. Since President Donald Trump took office, his eldest daughter has been a visible presence in the White House, where her husband, Jared Kushner, already serves as a senior adviser. On Friday, she participated in a meeting on vocational training with the president and German Chancellor Angela Merkel. Jamie Gorelick, an attorney and ethics adviser for Ivanka Trump, said Monday that the first daughter will not have an official title, but will get a West Wing office, government-issued communications devices and security clearance to access classified information. Gorelick said Ivanka Trump would follow the ethics rules that apply to government employees. "Our view is that the conservative approach is for Ivanka to voluntarily comply with the rules that would apply if she were a government employee, even though she is not," said Gorelick, who also helped Kushner with the legal strategy that led to his White House appointment. "The White House Counsel's Office agrees with that approach." Ivanka Trump's role has already come under scrutiny because there is little precedent for a member of the first family with this kind of influence. The White House did not immediately respond to a request for comment. A person with knowledge of Ivanka Trump's thinking, who requested anonymity to discuss private conversations, said she believes she can offer more independent perspective to her father by not serving as a White House staffer. A popular surrogate for her father on the campaign trail, Ivanka Trump moved her young family to Washington at the start of the administration and signaled plans to work on economic issues, like maternity leave and child care. In a statement, she said: "I will continue to offer my father my candid advice and counsel, as I have for my entire life." Federal anti-nepotism laws prevent relatives from being appointed to government positions. But the Justice Department's Office of Legal Counsel recently said the president's "special hiring authority" allowed him to appoint Kushner to the West Wing staff. Gorelick noted the office also made clear that the president could consult family members as private citizens, arguing that this is what Ivanka Trump will be doing. 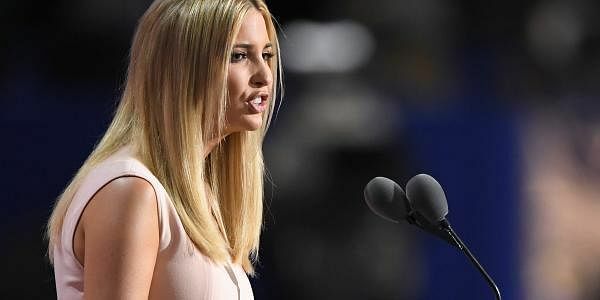 The first daughter has sought to distance herself from the Trump Organization and her lifestyle brand, which offers shoes, clothing and jewelry. She has removed herself from executive roles and will have a more hands-off approach to the brand — though she will still get certain information and will have the power to veto new deals if they raise ethical red flags. Richard Painter, a University of Minnesota law professor who served as President George W. Bush's chief White House lawyer on ethics, said that Ivanka Trump is effectively working as a White House employee. He said that "means that she, like her husband, has to follow the rules. It's not a huge deal if she stays out of things that affect her financial interests." Painter said that means Trump should avoid anything to do with foreign trade with countries where her products are made, as well as recuse herself from real estate matters, given Kushner's family real estate business. Trump says she will follow ethics rules and some of her financial information will be included in Kushner's official disclosures. She would have to disclose additional financial information if she were in a senior White House role, said Painter. That could include more details about her lifestyle brand, including her contracts and income. Attorney Andrew Herman, who has advised lawmakers on ethics issues, said he thought the administration should make her role official. He said: "I think the right way to do that is to make her a special government employee. But that implicates all kind of formal and disclosure issues." Ivanka Trump continues to own her brand. But she has handed daily management to the company president and has set up a trust to provide further oversight. The business cannot make deals with any foreign state, and the trustees will confer with Gorelick over any new agreements. Ivanka Trump will also be able to veto proposed new transactions. Ivanka Trump has also barred the business from using her image to promote the products in advertising or marketing. To be sure, the trustees are in the family — her husband's siblings Joshua Kushner and Nicole Meyer. But Gorelick said the goal of the trust wasn't to shield Trump from everything, but to remove her from the day-to-day operations. She also acknowledged that the arrangement did not eliminate conflicts, but she said Trump is trying to minimize them and will recuse herself from any administration decision-making that affects her business. Ivanka Trump has also written a book, "Women Who Work," that will be released in May. The proceeds and royalties will be donated to charity, Gorelick said.